BLACKFIRE Leather Conditioner keeps leather soft with state-of-the-art breathable polymers. Extreme UV protection resists leather yellowing and photo oxidation. The non-slick, satin finish created by Leather Conditioner resists abrasion, arming your car�s leather seats against daily wear and tear. In addition, BLACKFIRE Leather Conditioner leaves a moisture barrier to prevent moisture from breaking down leather or stitching. BLACKFIRE Leather Conditioner was developed to offer state-of-the-art UV protection plus a breathable moisture barrier that also guards against wear and abrasion. Sound like a tall order? It was, but BLACKFIRE�s chemist made it happen and now your vehicle reaps the benefits. BLACKFIRE Leather Conditioner penetrates deep into your leather for a conditioned, but not greasy, finish. To resist perspiration, salt, skin oil, and lotion stains, our chemist selected a co-polymer recently developed by Dow Corning. This co-polymer cross-links with itself to provide a blanket of protection on top of the leather. It blocks moisture yet still allows air flow through the coating to facilitate heat dissipation. For UV protection, BLACKFIRE�s chemist went all the way to Switzerland to CIBA, the maker of TINUVIN 5151. The result is a product that offers the best in leather protection and is also non-greasy, dries almost on contact to a matte finish, and isn't slippery. To pack the maximum amount of conditioning oils, protective polymers and UV-absorbers in the formula, it had to be a rich cream. 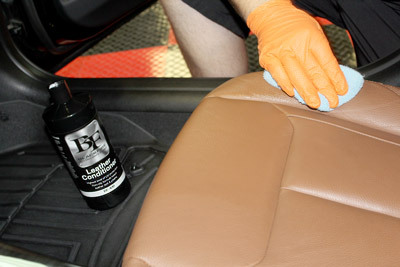 BLACKFIRE Leather Conditioner is like applying a moisturizing lotion to your leather seats. This product is not recommended on perforated leathers as it could clog the pores. Do not use on napped leathers such as suede.